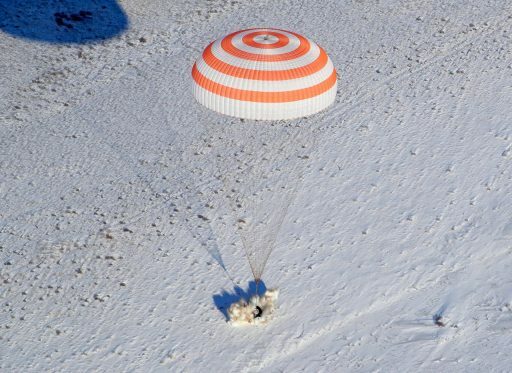 Two NASA Astronauts and a veteran Russian Cosmonaut are on the verge of their return to Earth after a 168-day stay on the International Space Station, set for a parachute-and-rocket-assisted touchdown on the frozen steppe of Kazakhstan just after sun-up on Wednesday aboard their Soyuz MS-06 spacecraft. Second-time Soyuz flier Aleksandr Misurkin, NASA Astronaut Mark Vande Hei and ISS veteran Joe Acaba finished final preparations for their overnight return after 24 weeks aboard the orbiting laboratory with Misurkin handing over command of the outpost to fellow Cosmonaut Anton Shkaplerov who will lead Expedition 55 over the next three months. The crew’s homecoming will begin with the closure of the hatches to their Soyuz MS-06 spacecraft at 19:50 UTC on Tuesday to set in motion the final preparatory steps for the spacecraft’s undocking from the Station’s Poisk module at 23:08 UTC. 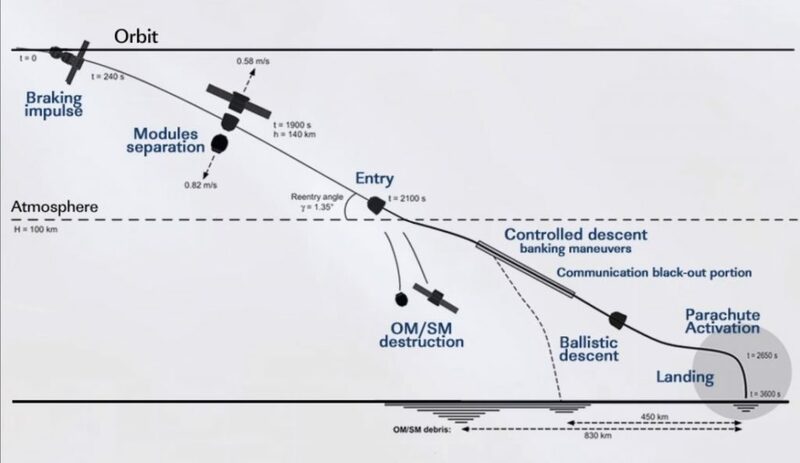 Pushing off with loaded springs, Soyuz will speed up its departure with its own thrusters to open a sufficient gap for the spacecraft’s critical deorbit maneuver at 1:38 UTC – a four-and-a-half-minute braking impulse to send the Soyuz out of orbit and onto a downward arc. Blazing through the atmosphere, the small Entry Module of the Soyuz with the three crewmen aboard will reverse through the sound barrier and deploy its three-stage parachute system to enter a vertical descent toward the remote landing site in South-Central Kazakhstan. Touchdown near the remote town of Zhezkazgan is planned at 2:31:58 UTC after a mission of 168 days and five hours or over 2,500 orbits around the Earth. 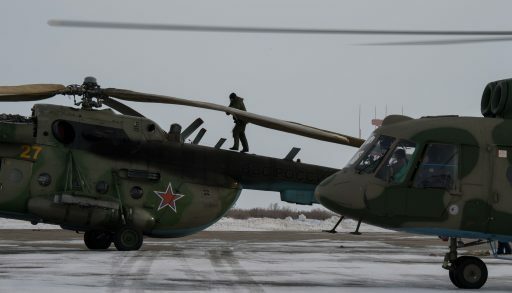 Landing is planned just twenty minutes after sunrise in the landing zone with temperatures around -4°C, cloudy skies and winds at 16 km/h from the west. Weather-wise, Wednesday appears to be the best day of the week as temperatures warm from lows of -10°C on Tuesday before the Mercury dips to -20°C again by the end of the week. Freezing rain and snowfall expected on Tuesday will not impact the pre-staging of recovery forces and precipitation should subside by sun-up on Wednesday to create favorable landing conditions for the Soyuz MS-06 spacecraft. 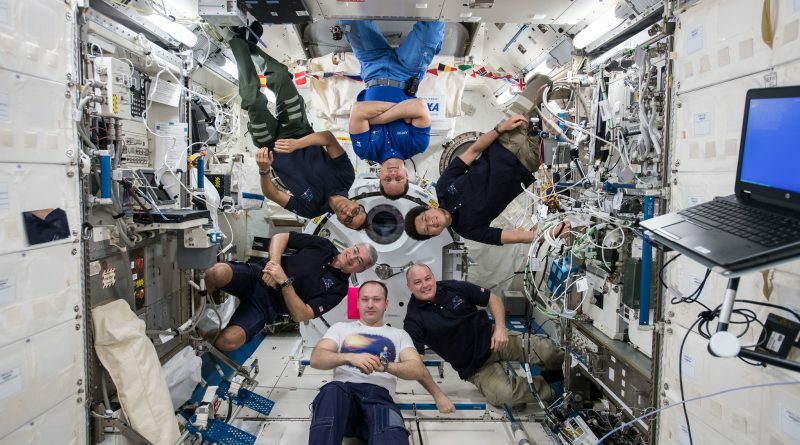 Wednesday morning’s landing will cap a busy mission for the crew of International Space Station Expedition 53/54, having launched back on September 12, 2017. 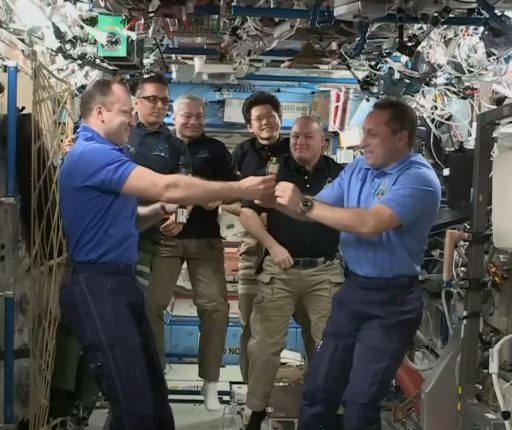 The 135th Soyuz mission reached its orbital destination within four orbits of launch and the U.S.-Russian crew trio was welcomed aboard ISS by the resident crew of Randy Bresnik, Sergey Ryazanskiy and Paolo Nespoli. The combined Expedition 53 crew hit the ground running with the departure of the Dragon SpX-12 cargo craft three days after Soyuz arrived and October saw three USOS EVAs performed by Bresnik, Vande Hei and Acaba to replace the first of two Latching End Effectors on the Station’s Canadarm2 to provide it with a new grappling hand after the 16-year old LEEs had begun to cause trouble when the arm went about its business on the outside of ISS. The crew welcomed the Cygnus OA-8 cargo ship in November and supported a quick-fire crew rotation in December with Ryazanskiy, Bresnik and Nespoli departing on the 14th and Soyuz MS-07 with Shkaplerov, Scott Tingle and Norishige Kanai inbound on the 19th to transition into ISS Expedition 54. 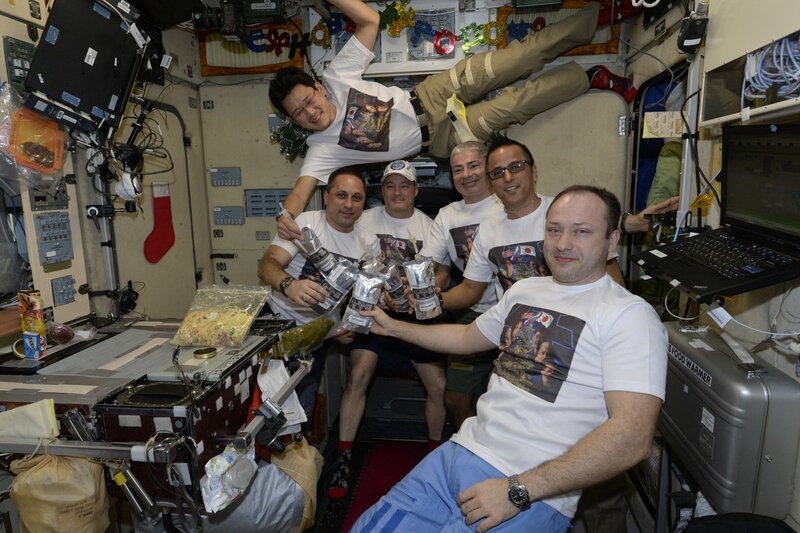 Dragon SpX-13 arrived in between Soyuz activities before the crew had a few quiet days over the holidays. 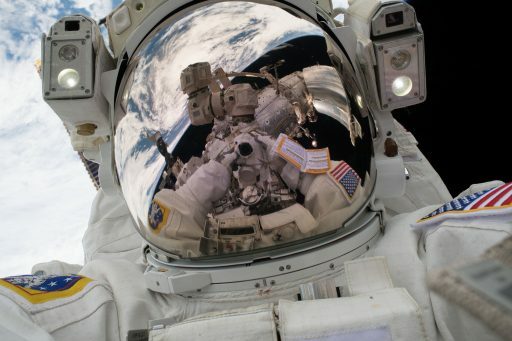 Another set of spacewalks was on tap in the new year: a pair of USOS excursions by Vande Hei, Tingle and Kanai accomplished the second LEE swap on the robotic arm while a Russian EVA by Misurkin and Shkaplerov revamped the high-gain communications system to be able to communicate through Russia’s Luch relay satellites. Over the course of their tenure on ISS, the Soyuz MS-06 trio oversaw five visiting vehicle arrivals, supported six spacewalks and conducted over 300 scientific experiments active aboard the orbiting laboratory. With their mission winding down, the Soyuz MS-06 crew members began preparing for their return at the start of the month, ramping up their daily exercise sessions to get ready for the re-adaptation to gravity and checking out equipment needed for their journey back to Earth. Soyuz MS-06 was put through a series of checkouts including a thruster test that briefly fired each of its DPO thrusters after sitting idle for nearly half a year. The three crew members also completed fit checks of their custom-made seat liners and pressure checks on their Sokol Launch and Entry Suits. Procedure reviews for nominal and off-nominal descent scenarios and a simulation aboard their Soyuz craft were also part of the crew’s schedule and the Russian crew members packed the Soyuz with return items stashed away in the Entry Module and disposal cargo on the Orbital Module. The Space Station’s robotic arm was walked off onto the Power & Data Grapple Fixture on the Zarya Module on February 20 to use the free-flying end to perform a close-up video survey of the Soyuz spacecraft to check for any external damage. External HD video and still cameras were also employed for the external survey to ensure Soyuz MS-06 is in good shape for its return. On Monday, the six Expedition 54 crew members gathered for the traditional Change of Command Ceremony as the departing commander, Aleksandr Misurkin, handed the reigns over to third-time ISS crew member Anton Shkaplerov who will lead the crew into Expedition 55 that formally begins at the moment Soyuz MS-06 undocks from ISS. 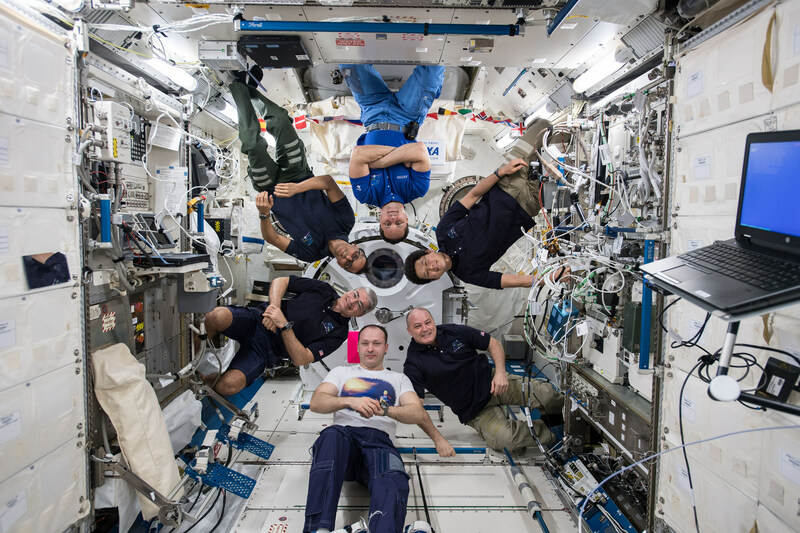 Gearing up for an overnight UTC return, the ISS crew members will have most of the day on Tuesday to rest up before entering final return preparations in the late afternoon hours when the Soyuz spacecraft will be powered up for a final round of communication checks through Russian ground stations and an update to the descent profile based on the latest trajectory calculations. The crew will have one final joint meal in orbit before they will gather in the Poisk module to split in two groups as the departing crew members float aboard their Soyuz spacecraft. Once hatches on both sides of the interface are closed, the Soyuz crew will command valves to open and vent the vestibule area between the Soyuz and Poisk to vacuum followed by an hour of pressure checks to ensure both hatches are tight. While leak checks are underway, the crew members will don their Sokol Launch and Entry Suits, work through steps to transition Soyuz to autonomous power and RF communications and then vacate the Orbital Module. 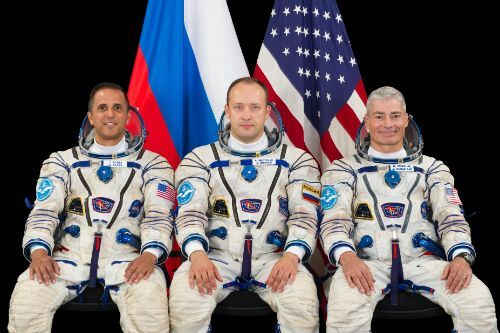 Taking their seats inside the small Entry Module, Aleksandr Misurkin will be in the Commander’s position in the center with Mark Vande Hei in the co-pilot position to the left and Joe Acaba fulfilling a supporting role from the right seat. Once in their seats, the crew will close the Entry Module hatch and complete a leak check on their Sokol suits as well as the internal Soyuz hatch. The hooks on the Poisk module will open up well ahead of undocking so that Soyuz is only held in place by its own hooks until activation of the SSVP docking mechanism at the five-minute mark to separation. The undocking command will be issued 90 seconds prior to undocking to initiate the opening of the Soyuz hooks to break the structural connection between the spacecraft and the Space Station. At 23:08 UTC, the seven-metric-ton Soyuz will push off with four loaded spring assemblies to initiate a slow opening rate of 0.1 meter per second to drift away from the Poisk module. Soyuz will move away from ISS without propulsion for two minutes to open a sufficient gap for its separation maneuvers that are designed to increase the departure rate of the spacecraft and set it on a course away from ISS along the velocity vector. Heading out on one and a half orbits of free flight, the Soyuz reach a separation distance of around 12 Kilometers for the deorbit burn, giving the crew some quiet time before pressing into the final setup steps for descent when flying over Russian ground stations on their last orbit around Earth. Soyuz will maneuver into a tail-first orientation and open a protective cover shielding the main propulsion system to clear the way for ignition of the 300-Kilogram-force S5.80 engine at 1:38 UTC on a burn of four minutes and 40 seconds. 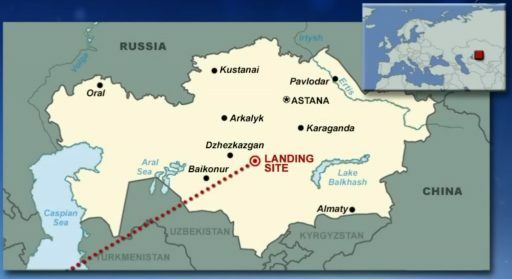 Stepping on the brakes, Soyuz is planned to slow down by 128 meters per second to transition from a stable orbital trajectory 400 Kilometers in altitude to a sub-orbital arc that intercepts the dense atmosphere over northern Iraq to carry Soyuz to its remote landing location. Traversing through orbital night over the Atlantic Ocean, the crew will close their helmets and the Orbital Module will open a valve to vent down to the vacuum of space in anticipation of the pyrotechnic separation of the three sections of the Soyuz – expected when crossing the Red Sea at an altitude of 140 Kilometers on a north-easterly heading toward the Kazakhstan landing site. After separation, the Orbital and Service Modules will be headed toward a fiery demise while the Entry Module fires up its thruster system to enter the proper posture for atmospheric entry. Soyuz is expected to hit the discernible atmosphere at 2:08 UTC when dipping below 100 Kilometers over the border of Iran and Iraq – starting the process of slowing from 7.62 Kilometers per second to a complete stand-still in just over 23 minutes. The Entry Module will stick to a fixed orientation for a minute and a half before active entry guidance kicks in to take the capsule through a series of bank maneuvers to dissipate energy and actively modify lift to control its downrange distance toward the parachute opening location. Blazing through the dense layer of the atmosphere, Soyuz will be lit up by plasma as its heat shield endures temperatures of up to 1,600°C and slowly burns away to create a cooler boundary layer between the spacecraft and the extremely hot shockwave layer in front of it. For the crew, G-forces will be on the increase as Soyuz descends, peaking at up to five Gs when passing through 33 Kilometers in altitude at which point the spacecraft emerges from the plasma blackout. 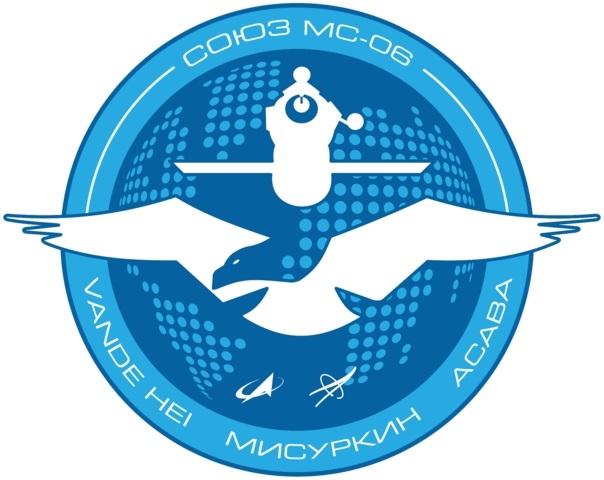 Barreling through the lower atmosphere, Soyuz will slow to a speed of Mach 0.7 when beginning its three-stage parachute opening sequence at an altitude of 10.8 Kilometers – ejecting a pair of pilot chutes that pull out the larger drogue to slow the spacecraft to a speed of 80 meters per second for the deployment of the large orange-and-white main chute at an altitude of 7.5 Kilometers. Transitioning into a vertical descent under the main chute, Soyuz will enter the fast-paced events of its Landing Program at 5.5 Kilometers – dropping the heat shield to expose the landing thrusters and altimeter, re-hooking the spacecraft to a symmetrical arrangement under the chute, jettisoning the blackened window covers and equalizing the cabin pressure. 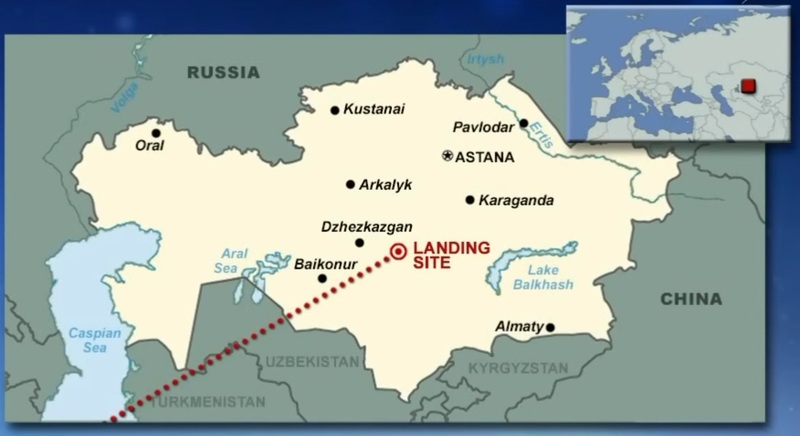 Touchdown is planned at 2:31:58 UTC in the Southern Landing Zone located 147 Kilometers south-east of Zhezkazgan where most Soyuz missions landed in recent years. 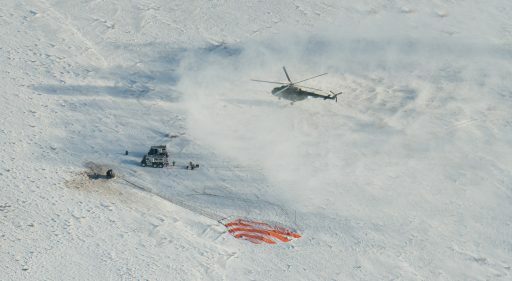 Recovery forces in ground-based vehicles and helicopters will descend on the landing site to assist the returned crew members out of their Soyuz spacecraft before going through initial medical checks at the landing site and flying over to the staging city of Karaganda from where Misurkin will head back to Moscow while a NASA aircraft takes Vande Hei and Acaba on an all-day journey back to Houston’s Johnson Space Center. 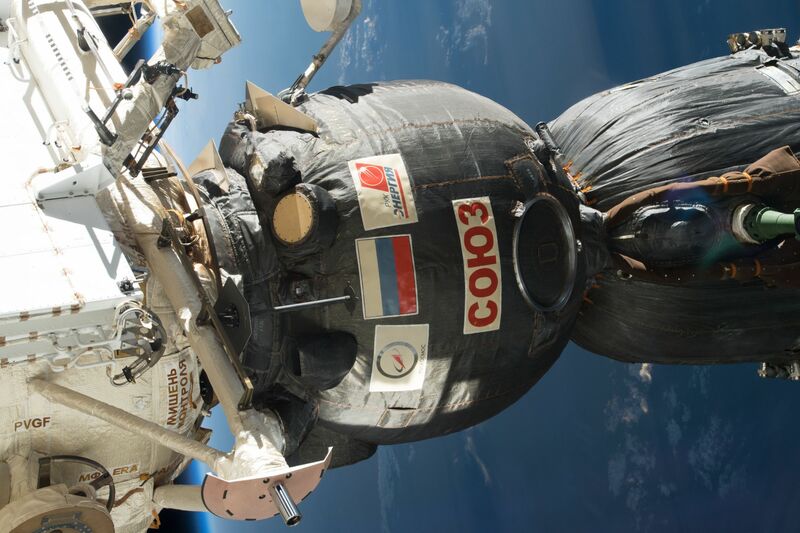 Copyright © 2019 Soyuz MS-06 | Spaceflight101. All rights reserved.